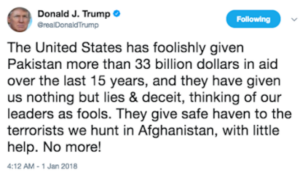 On the campaign trail last year candidate Donald Trump decried the tendency of the US to give money to countries that harm American national interests and those of our allies. The President is making good on his promise to make sure America wins by challenging foreign aid to countries, groups, and international organizations that do not support US interests. He has also been using Twitter to annoy his opponents, rally his supporters, and to advance US interests. During the campaign Donald Trump sent out many inflammatory tweets that would quickly draw criticism from the media and political establishment; they would also rally his base. From the beginning, Trump has used social media to make certain he was defining the narrative. The more the media and political elites attacked him, the more his supporters loved him. The media simply did not know how out of touch and vindictive they sounded to average Americans. Far from being a crazy, lunatic, loose cannon, Donald Trump had a carefully crafted strategy at work. If one did not know better, one might even imagine it to be a thoroughly polled and studied approach. Naturally, the left likes to portray President Trump and his tweets as resulting from madness or a feeling of sexual inadequacy. They simply cannot accept that he is smarter than they are. 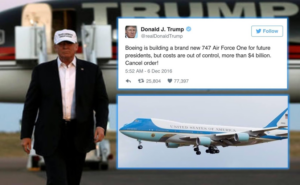 Shortly after he won last year’s election, President Trump tweeted about plans to replace Air Force One, complaining that the replacement plane was too expensive. 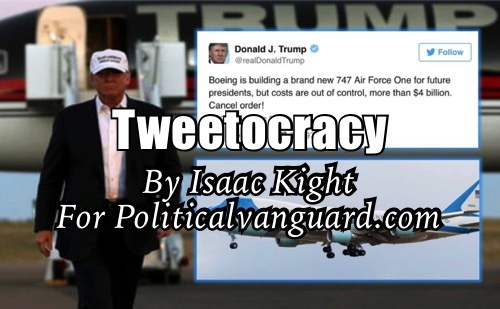 Shortly thereafter, Boeing announced a dramatic decrease in the price of the new plane, and now plans are under way to continue with procurement. The President likewise targeted the F-35 Lightning II stealth fighter stating his belief that existing air frames would be sufficient. Lockheed Martin decreased the price. In these and many other instances, the President has had great success using Twitter to achieve results for the American people. President Trump is at it again, this time in the arena of foreign policy. In some ways, President Trump has replaced the State Department with his Twitter feed. Rather than delivering subtle messages to foreign leaders, made only more subtle by diplomatic niceties, President Trump speaks his mind blatantly and openly to the world. After he announced his plan to relocate the United States Embassy to Jerusalem, the capital of Israel, in accordance with a 1995 Congressional resolution, the United Nations began to debate the move. President Trump was very clear: there would be consequences for opposing US policy. The UN General Assembly passed a resolution condemning the move and the administration announced a $285 million dollar decrease in the US portion of the United Nations budget. It must be noted the UN had already made plans to reduce its budget by about this amount, but it is not clear they intended for the reduction to come entirely out of the US contribution. At a cabinet meeting President Trump decreed: “This isn’t like it used to be where they could vote against you and then you pay them hundreds of millions of dollars. We’re not going to be taken advantage of any longer.” The United States contributes about 22% of the UN’s annual budget, $3.3 billion in total making this cut just less than a 10% of the US contribution. 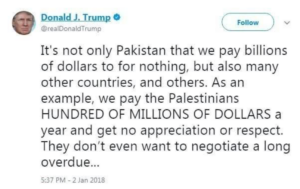 The Pakistani government immediately “summoned” the US Ambassador to Pakistan to discuss this tweet. Perhaps instead they should be holding top level meetings to reexamine their policies. Pakistani Foreign Minister Khawaja Muhammed Asif accused the US of betrayal this week as the United States announced the suspension of $2 billion in military and security aid. Senator Rand Paul (R-KY), long an opponent of foreign aid to duplicitous countries, has introduced a bill to have the aid transferred to US domestic infrastructure until Pakistan demonstrates a commitment to fighting terrorism. China will be trying to move in to offer aid to Pakistan, but they lack the resources to offer the kind of support the US has offered in the past. The United States has long sought a balance between India and Pakistan, helping both countries in the hope of maintaining peaceful relations betwixt them. Since the end of the Cold War, the US has grown only closer to India in trade and policy. India, Israel, and the United States cooperate in the development of military technology, for example. To counterbalance this, the United States has maintained a relationship with Pakistan as well. Pakistan has, nevertheless, been a thorn in our side. The country’s intelligence service, the ISI, gave aid and comfort to no less a villain than Osama Bin Laden. The ISI also finances and organizes terrorism in India. Pakistan gives shelter to the Taliban and has undermined US efforts to bring peace and stability to Afghanistan. Perhaps they will be more cooperative in the future? One thing is certain, the government in Islamabad is on notice. President Trump next took the opportunity to strike out at another notoriously intransigent force that defies the United States while taking our money: the Palestinians. Time and again Palestinian leadership has defied efforts to seek a peaceful solution to the conflict. Peace negotiations often lead to violence on the part of the Palis. In the most infamous case in 2000, Prime Minister Ehud Barak, together with President Bill Clinton, offered then Palestinian leader Yasser Arafat everything he could ever ask for to make peace. The result? He walked away from negotiations and incited another “Intifada” (uprising) that cost dozens of Israeli lives. The scenario repeated itself in 2007 with between Ehud Olmert and Mahmoud Abbas. President Trump is not interested in these games, he wants results. Trump is very correct that Jerusalem in now off of the table in negotiations. Shortly after his announcement the Israeli Knesset (parliament) passed a law requiring a an unprecedented 2/3rds majority of the Knesset to approve any peace deal in which any part of Jerusalem would be granted to the Palestinians. 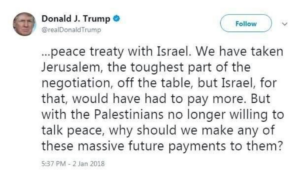 President Trump has shown the Palestinians that they cannot have it both ways: they cannot continue to endorse violence and duck peace negotiations while pretending to be the injured party. In the changing security atmosphere of the Middle East, the Arab Sunni states, especially Egypt, Jordan, and Saudi Arabia, need Israel as an ally against Iran. The Palestinians are on the wrong side of that equation in that Hamas, a terror group that controls the Gaza Strip, is financed and armed by Iran. They have even antagonized the Egyptian military in the past, leading Egypt to establish a tough security corridor along their portion of the Gaza border. The Egyptian the government has begun promoting the idea of Ramallah, where the Palestinian Authority currently sits, as the capital of any future Palestinians state. It is a sad reality that the Palestinian elites live in resort-like palaces while average Palestinians are unable to work or conduct business due to the oppression of the Palestinian Authority and the perpetuation of the conflict. The US is paying to back an oppressive regime that suppresses free speech, permits no freedom of religion, and which employs one in four Palestinians to watch over the other three. The United States need not subsidize this situation. As George Friedman of Stratfor pointed out four years ago, North Korea likes to play weak, unstable, and crazy to attract attention to itself. This is how they manipulate foreign powers into giving them food and aid, and ensure they remain on the policy radar. 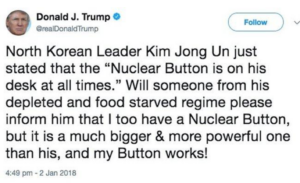 President Donald Trump is calling Un on this bluff. In reality, North Koreans are starving and suffering from many kinds of illness. There have been several recent defectors who have risked their lives under fire from North Korean forces along the Demiliterized Zone (DMZ). These men have been found to be half-starved, ill with many diseases, and infected with parasites. The NorKs are furloughing soldiers so they can go in search of food. The American left likes to claim President Trump is trying to incite a war. They spread stories about how everyone in Washington is fearful that Trump’s Tweets will precipitate a war. Again, the left occupies an alternate universe. Japan and South Korea have supported Trump’s tough stance against North Korea and they would not do so if they were the least bit concerned about Trump being mentally unstable or that he might inadvertently incite a war. China has begun to cooperate with the US in small ways: they have refused to clear financial transactions for North Korea and they claim to have canceled fuel shipments. To encourage China’s cooperation the United States International Trade Commission (ITC) increased duties on a small number of Chinese goods. The Department of Commerce is contemplating increased duties on everything from Chinese steel to solar panels. Such duties would be of great benefit to US industries, while doing great harm to the increasingly fragile Chinese economy. Kim Jong Un is among the youngest national leaders on the world stage. His predecessors have forced the country to worship them like G-ds. Un has big shoes to fill when it comes to evil tyrants from Pyongyang. Trump’s attacks on him have belittled him personally as “Rocketman” and he tales every opportunity to point to Un’s “impotence” in in foreign relations; a jab at his masculinity. Un is being ridiculed by the most powerful man in the world, his bluff has been called on his nuclear programme, and he knows his own forces are in no condition to confront anyone. 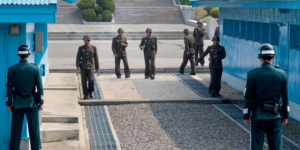 It is no surprise then, that North Korea recently announced their eagerness to open talks with the South, in what amounts to near acquiescence for the NorKs. President Trump warned the United Nations not to oppose US policy, and when they ignored him, he showed them the very real consequences. The UN is not likely to become ardently pro-US, but they will think twice before taking such steps in the future. The Pakistani government is also on notice and is going to have to reconsider its duplicitous policies. In the meantime, they will receive not a dime of military and security aid from the United States. The Palestinians have lost Jerusalem and will face reduced or withheld US aid as well. Finally, North Korea has been isolated and its leader browbeaten, they have acquiesced to renewed talks with South Korea. For all of the Left’s talk of belligerence and mental illness, the President’s foreign policy has been both consistent and wildly successful. Perhaps history will record that President Trump used Twitter to prevent several wars and bring lasting peace to long standing conflicts.